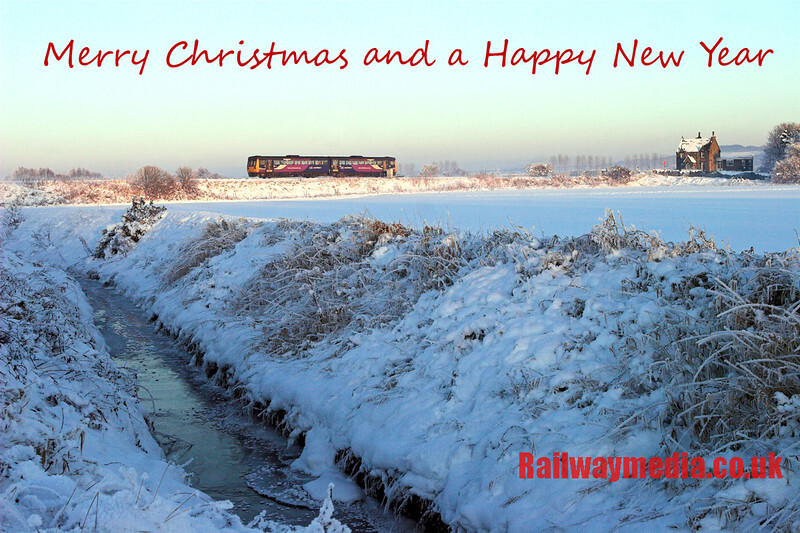 Welcome to the Christmas Edition of the Railwaymedia Blog; not that there is anything especially Christmassy about it, but I am certain it will be the last one of 2013 as I am working more or less solidly over the Christmas period so, barring a sudden snowfall or hearing about anything extremely special running, I'm unlikely to get out with my camera until January. It has also probably been my longest ever gap since the previous blog, getting on for a month and a half, for two quite opposing reasons: first off I didn't go anywhere for almost three weeks and then I had two weeks where I was out and about all the time, though not necessarily with my camera. 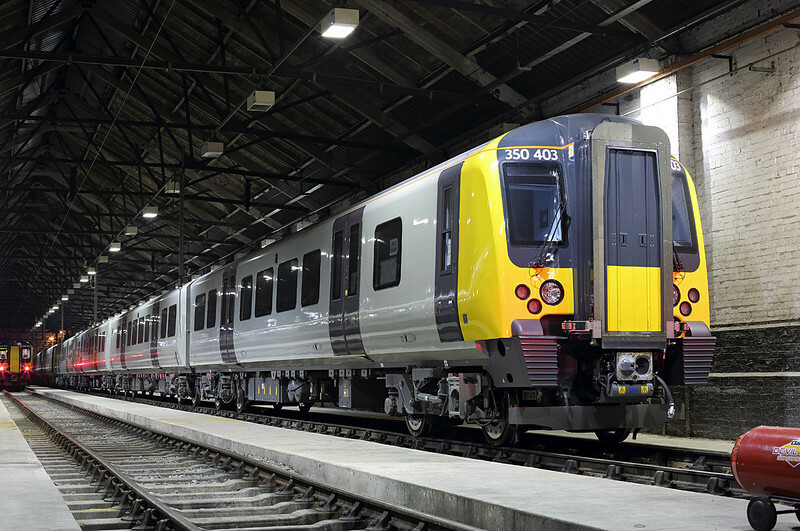 The biggest news of November in the North West was probably the arrival of the first of Trans Pennine Express' new class 350/4 Siemens Desiro EMUs. 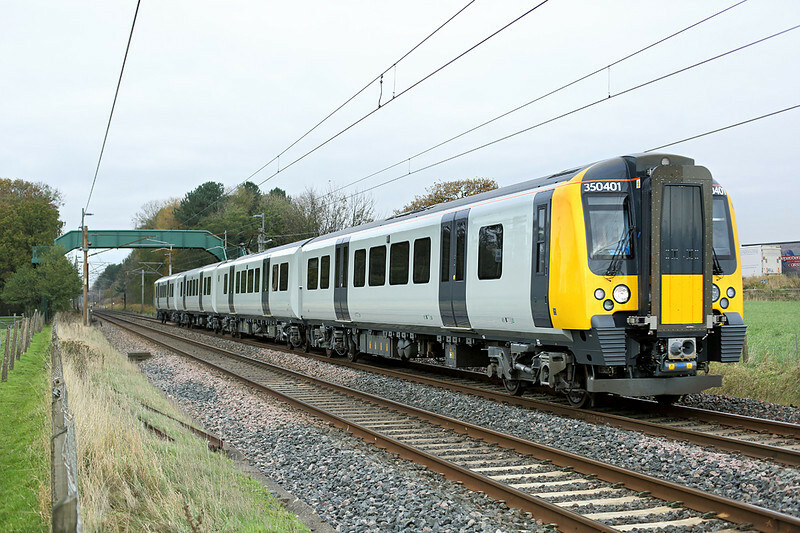 As the future of the TPE franchise is still unclear, though an extension is likely, they have been delivered in a similar undercoat livery to that which London Midland's original batches of class 350's were first seen. 350401, seen above, was initially used for type testing between Crewe and Carnforth and could be seen heading up the main line following the hired in London Midland class 350 that was being used for driver training. That has since been returned, with one of the three 350/4's that have so far been delivered taking up this duty. 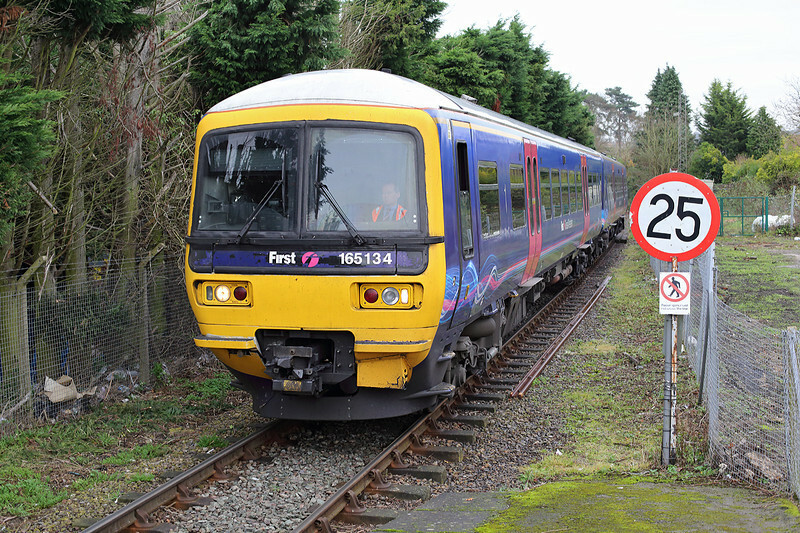 They have also been used to test the newly electrified Chat Moss line between Newton-le-Willows and Manchester, which was finally energised this month. Through electric services between Edinburgh, Glasgow and Manchester, which were due to start with the December timetable change, have now been postponed until the new year. Services have been altered though to enable the 350's to be filtered into service one they are delivered and commisioned, much to the chagrin of commuters from Bolton who now have one less train an hour. With the electrification complete of the eastern end of the Chat Moss route, work has now started on the sections between Earlestown and Wigan to Edge Hill (Liverpool), causing much consternation to one particular pensioner according to the Wigan Observer. I love local news reporting! Three weeks spent on night shift was the reason I didn't go anywhere for most of November, though I did take my camera with me to work most nights, principally to get shots of the newly delivered 350's, but there was also an ecclectic mix of locos appearing at Crewe over that time. 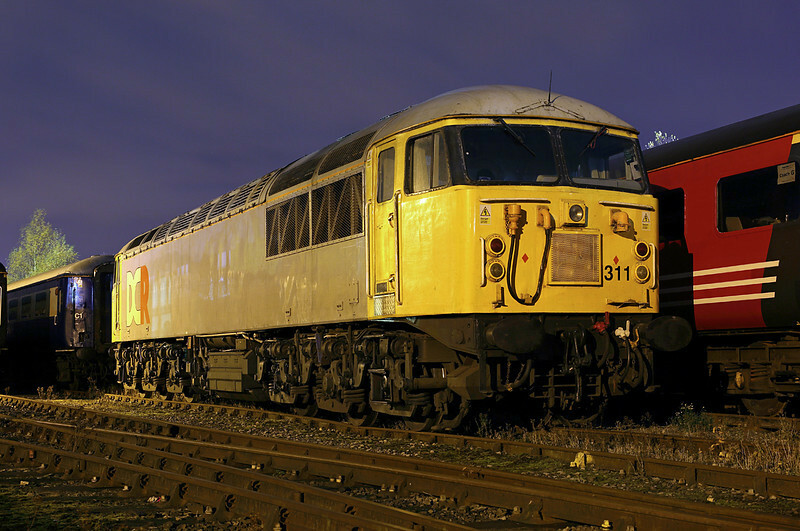 Devon and Cornwall Railway's 56311 was a surprise visitor one night on the former Diesel Depot. The start of more or less two weeks off was marked by a plan to visit a few Wetherspoon pubs in Yorkshire with a friend. With a few days available I took the opportunity of getting a Coast and Peaks Rover. It's a good value ticket covering from Sheffield and Derby right across to Holyhead and was a regular purchase for several of us in school holidays back in the 1980's. With a lot of bus journeys needed to get to some of the places we wanted to visit I ended up not taking my camera on a few of the days. It made a nice change not to have to carry a bag around with me. I got to visit places I've not been to for years; places like Wombwell that we used to visit for the bus scrap yard there and Sandiacre which was the destination if trying to get round Toton Yard. 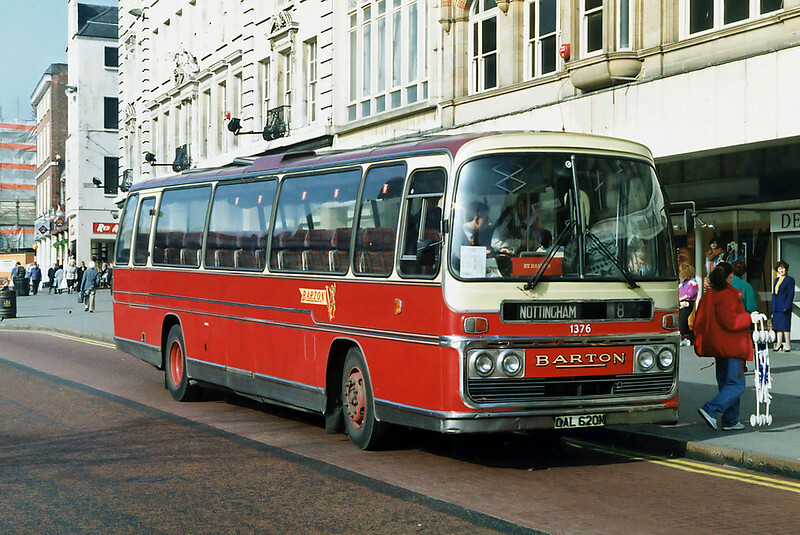 Alas the Barton buses that used to operate the route from Long Eaton station have changed; on my last visit in perhaps 1989 they were still using elderly coaches complete with conductresses. On my final day using the Coast and Peaks Rover I knew I would be making more use of trains than I had on the other three so I took my camera. I started at another place I'd not visited for years, Worksop. 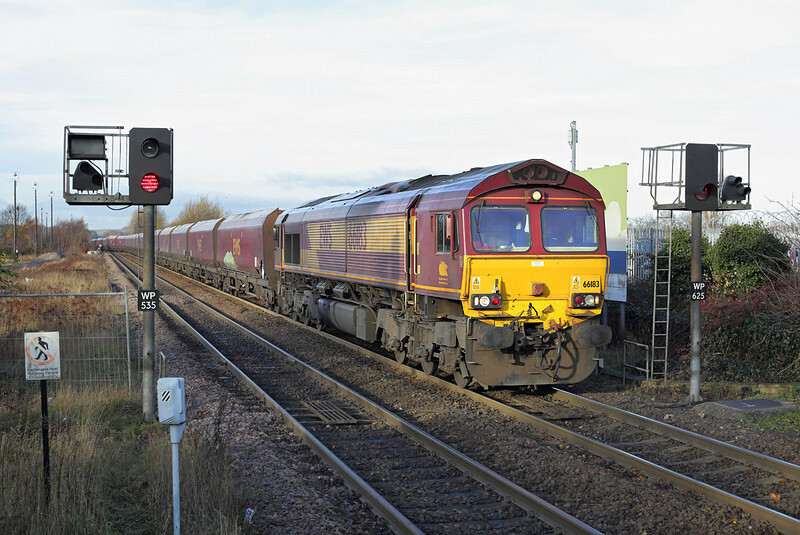 Nearby Retford was a popular place for us to trainspot then as you got both trains on the East Coast Main Line but also the frequent class 56 hauled coal trains on the bottom line heading to Cottam and West Burton power stations. Whilst the 56's have of course gone I was pleased to see there is still a bit of coal train movement in the area with two passing not long after my arrival. I then headed down the Robin Hood Line towards Nottingham, the northern end of which I have never previously travelled over. This end of the line, although it only has an hourly passenger service in the main, is worth investigating further: I noticed some nice semaphores at Creswell. I alighted at Bulwell for a quick change onto the Nottingham Tramway. I wanted to call off at Wilkinson Street depot to see if any of the new trams were visible. 22 new Alstom Citadis trams have been ordered to supplement the current fleet of 15 Bombardier ones for when the extensions of the network to Beeston and Clifton are completed by the end of next year, 2014. 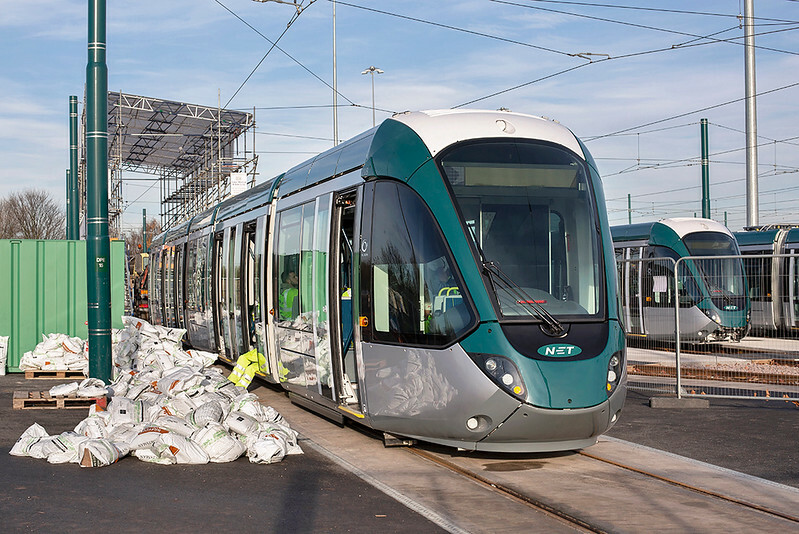 There were four of the new trams visible, this one, number 218, was obviously being used for load tests judging by the quantity of sandbags placed next to it. Testing is taking place at night apparently. I managed one more trip out last week. Again it was based round visiting Wetherspoons, at this time of year with it getting dark so early it is a challenge finding locations worth going to for photography, so I prefer to do other things and to just try to build in a little time for pictures enroute. The plan was for a trip across Buckinghamshire starting at High Wycombe and ending up in Milton Keynes. The itinary worked suprisingly well enabling me to get to not only 10 Wetherspoons I hadn't previously visited but also to ride on three railway lines I've never traversed before. The first of these was Marlow which is only a 20 minute bus ride across country from the Chiltern line at High Wycombe. Hugging the River Thames for most of its route this branch line runs hourly at off-peak times with a change of ends required at Bourne End. 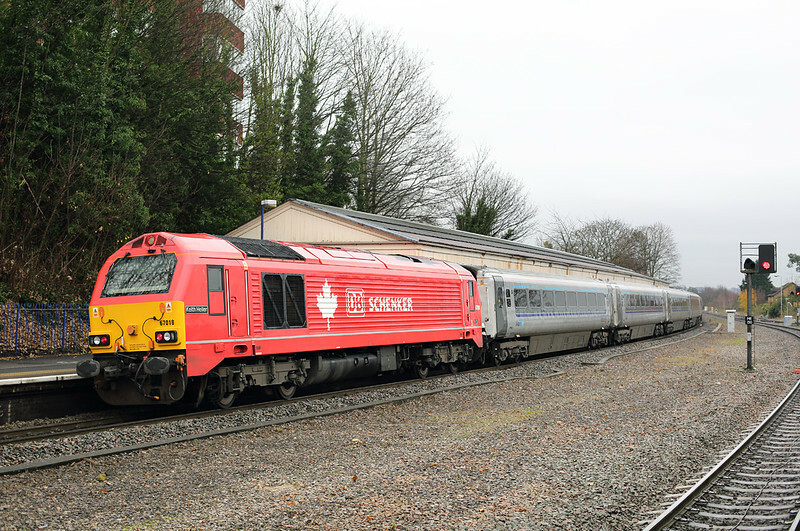 During peak times through trains from Paddington run to here with the branch unit shuttling between Bourne End and Marlow. The second branch, which actually terminates only a few miles from Marlow, was from Twyford to Henley-on-Thames. 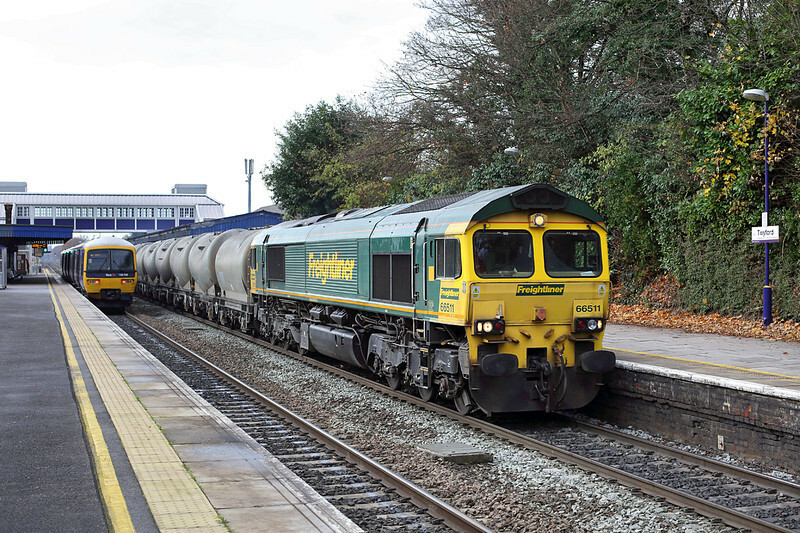 My first stroke of photographic luck was as I alighted at Twyford I knew from Real Time Trains that a Theales to Earles Sidings cement train was approaching. I decided to go to the east end of the platform to avoid the train I had alighted from getting in the way. As it turned out I would have been better going to the other end, but it would have been close. Back on the bus to High Wycombe and again I was lucky that during my 5 minute wait for a northbound train there 67018 came the other way propelling the 1312 Birmingham to London Marylebone service. The diagrams for their loco services have obviously changed from the new timetable as I'm fairly certain this wasn't one of their booked services earlier in the year. 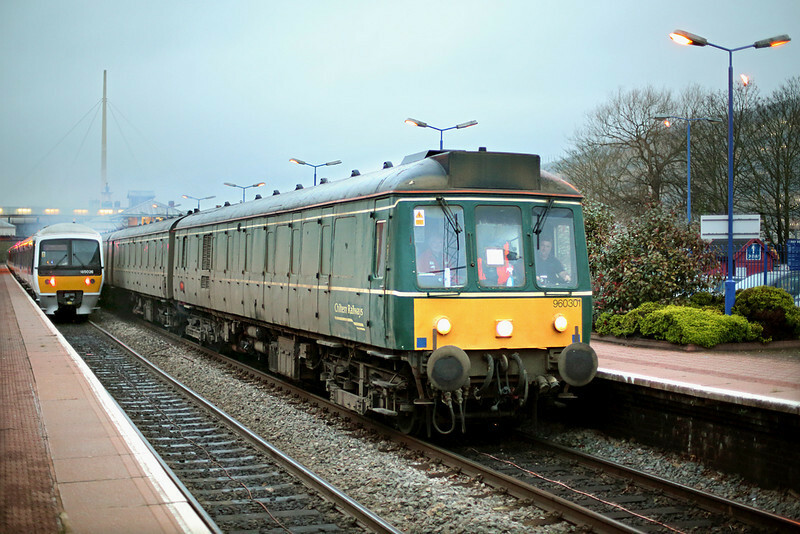 Usually the loco-hauled services are shown in Chiltern Railway's timetable as 'MS' for Mainline Silver, the rest being units, so maybe this was filling in for a failed class 168. Onto Princes Risborough in order to do the branch line to Aylesbury and again I was lucky to get a freight train in the 20 minutes I had there changing trains. 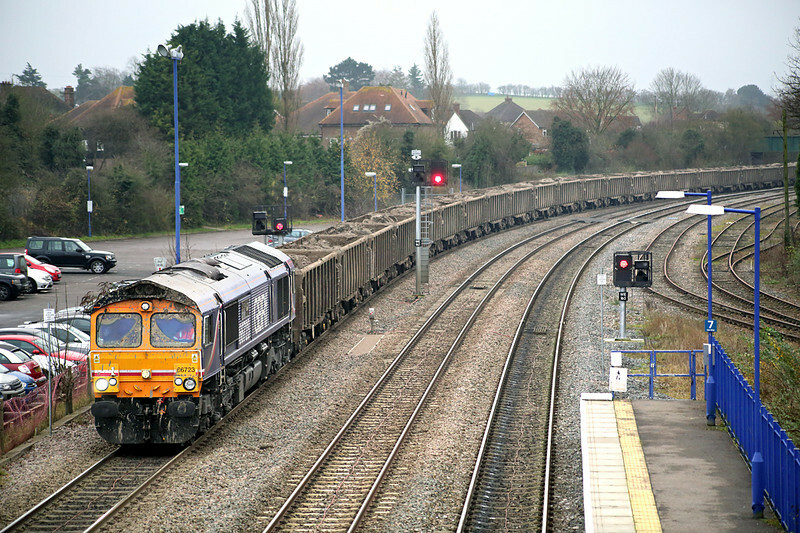 GBRF's 66723 came through heading for Calvert with a load of London Clay excavated from the Crossrail tunnels. Judging by the state of the leading cab it had been parked a bit too close to the conveyor belt filling the wagons. With the light rapidly fading now it was gone 3pm, I expected that to be it for the day for photography but I arrived at Aylesbury to find Chiltern's converted former class 117 unit about to leave on a water-cannon duty to Harrow. I have better shots of the unit as it was now almost dark, but it was a nice end to the day with just the delights of Milton Keynes to look forward to after. So as mentioned earlier that is probably the last with regards to pointing my camera at anything for 2013. I am still ploughing through reprocessing and recaptioning pictures on my website, I should have all the DMUs done by Christmas leaving me with just EMUs to do in January before I can get on with the job of scanning in my remaining railway and bus pictures from the 1990s. Thanks for reading, please look out in January for the next edition of my blog, here's wishing you all a Merry Christmas and a Happy New Year.